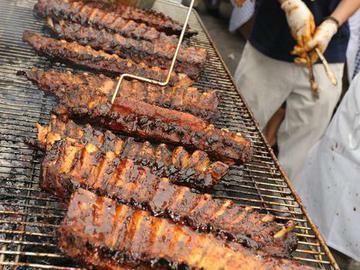 This VIP Ticket to the Big Apple Barbecue Block Party in Madison Square Park includes access to a private tent party in the park on the Friday night, and an otherwise sold out FastPass for you and a guest (good for Saturday & Sunday). From 7-9 PM on Friday, join us for an exclusive sneak peak at "Barbecue Eve". Sip on cocktails, wine and beer while noshing on a barbecue buffet from Blue Smoke, and listen to live music from The Crooners. Plus take a tour of the grounds and meet the 16 pitmasters as they 'cue up for the big weekend ahead. With your ticket to the pre-party, you’ll receive a FastPass for you and a guest for use during both days of the barbecue (otherwise sold out). What this means: access to the express lines at every barbecue station and a $100 value redeemable for food, beverages and merchandise! Proceeds from the 9th Annual Big Apple Barbecue Block Party benefit the Madison Square Park Conservancy. Must be 21 and older and valid ID must be presented at the door. Offer is final sale and nonrefundable.